The ECB recently released a Working Paper – Financial Fragilty of Euro Area Households – which attempts “to identify distressed households by taking account of both the solvency and the liquidity situation of an individual household”. The paper uses survey data based on a sample of 51,000 households in 14 Euro nations. Taken at face value, the research provides some interesting and, perhaps, unexpected outcomes with respect to where the vulnerability lies. On the back of further damaging news about the economic prospects for Germany, the ECB research should, but won’t, motivate a major shift in German government policy towards stimulus. But then the head of the Bundesbank claims that stimulus is not required because Germany is travelling at normal capacity. The data would suggest otherwise and the ECB research would suggest that Germany is very vulnerable to a further recession. The boost to the peripheral countries from an increase in German public investment is … likely to be negligible … And with the economy operating at normal capacity utilisation, Germany is not in need of stimulus either — and this will remain the case with the revised forecasts that still foresee growth in line with potential. He was attacking the calls by ECB President Mario Draghi for greater public investment in Germany as a way of boosting demand throughout the Eurozone. The Ifo Business Climate Index for industry and trade in Germany fell in October to 103.2 points from 104.7 points in the previous month. Assessments of the current business situation were once again less favourable than last month. Expectations with regard to the six-month business outlook continued to cloud over. The outlook for the German economy deteriorated once again. Confidence in Germany’s powerhouse manufacturing sector “deteriorated significantly” and “capacity utilisation rates fell by 0.3 percentage points to 83.7 percent”. 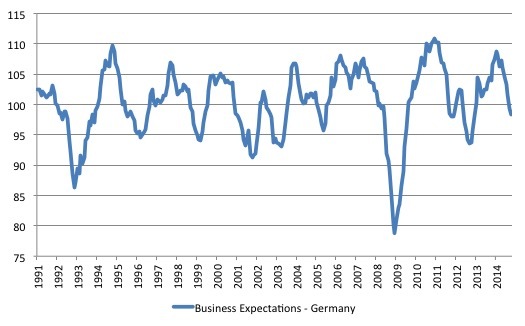 The following graph shows the long-term evolution of Business Expectations in Germany. The – Data is available from Ifo from January 1991. The long-term average is 100.4 and the October result was 98.3 per cent. As you can see declines of this magnitude are not short-lived affairs. The forward looking information would suggest that Germany’s economy will hit zero growth in the coming quarters at best. That assessment is reinforced by the following graph from Ifo, which shows the employment intentions of manufacturing firms (red line, left axis) and the actual persons employed in manufacturing (blue bars, right axis). You will note that the plans lead employment in the sense that the turning point of the former is reached before the turning point of the latter. A lagged indicator behaves in the opposite manner. The rebound in employment over 2013 and 2014 has been very weak relative to previous shifts and the plunge in employment plans is signalling that soon, those plans will manifest in less employment. Try squaring that up against Jens Weidmann’s claims that the German “economy operating at normal capacity utilisation”. Well, don’t waste your time trying – he was clearly making a political statement as he often does. Given the trends, the latest ECB research suggests that if Weidmann is wrong then Angela Merkel’s frugal ‘schwäbische Hausfrau’, who in reality might not be so frugal after all, is in trouble. The ECB research attempts to “stress test … individual household balance sheets” and develop a measure of household distress, which includes consideration of “data on income, expenditure, assets, debt and collateral”. 1. Probability of Default (PD) – “the changes in the number of distressed households”. 2. Exposure at Default (EAD) – “acts as a yardstick for” non-performaing loans. 3. Loss Given Default (LGD) – this is a “key measure to analyse potential credit losses that banks could incur in the aftermath of household defaults”. 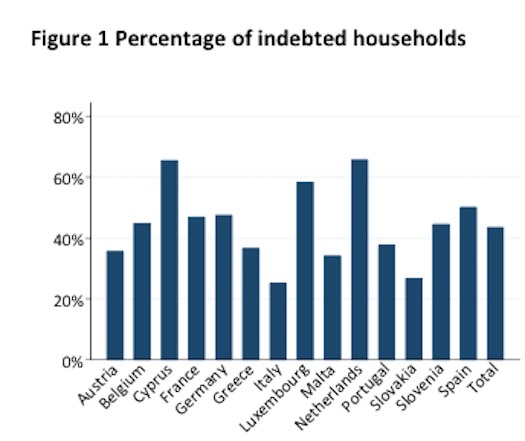 The data shows that Germany has a relatively high proportion of indebted households. The following graph (Figure 1 from the Working Paper) shows that Germany is well above the average. Italy is well below the average. The ECB firstly creates profiles of distressed households and their characteristics. They then impose what they call “shocks” to “examine what would happen to these indebted households in terms of their ability “to repay their debt on time” and what would be the exposure and losses given default. The shocks include Interest rate rises (1 per cent, 2 per cent and 3 per cent), rises in the unemployment rate (3 percentage points and 5 percentage points), and house price shocks (10 per cent, 20 per cent and 30 per cent decline in prices). By way of documenting the financially vulnerable households, the results are summarised in their Figure 9 (reproduced below), which allows us to consider the two dimensions of distress – “solvency versus liquidity”. 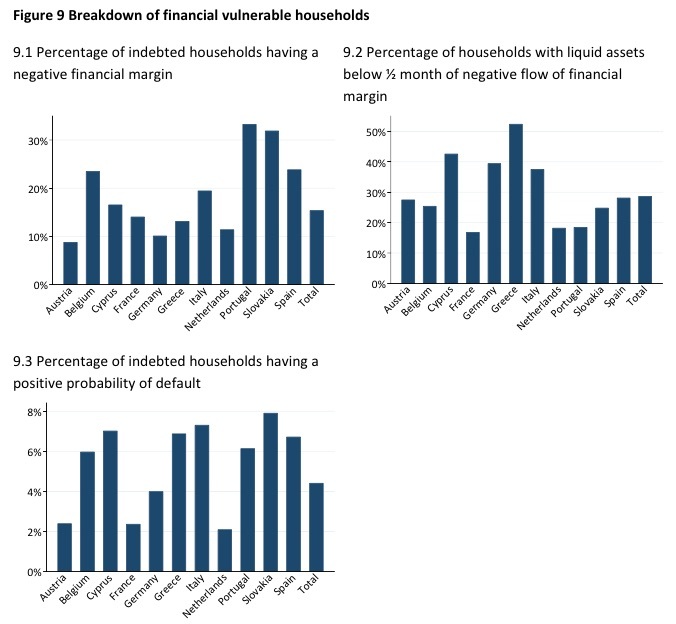 … considering the first dimension, in Portugal the percentage of indebted households with a negative financial margin is the highest, while the second dimension shows the lowest percentage for Portugal, indicating that the Portuguese households have relatively more liquid assets than households in other countries. In this respect Greece is an inverse picture of Portugal. This is because many Greek households seem to have enough income to cover their basic expenses and debt payments, but not too many liquid assets to cover the discrepancy between their expenses and their income. You can draw your conclusions about the other nations accordingly. After building their models of distressed households and their characteristics, the ECB then examines the outcomes of the shocks for their credit risk indicators. The results for the Probability of Default are summarised in Table 1 (page 35) which I reproduce here. For most nations, the interest rate shock is more severe than the income shock arising from loss of job. France is a clear exception here and that is because France has a higher rate of fixed rate mortgages. The different impacts also reflect the fact that households in some nations are more thrifty (that is, have higher savings) and can withstand periods of low income for longer than those that are more illiquid. The impact of a 3 per cent rise in interest rates on household solvency in Portugal is staggering (a rise of 21.3 per cent in the proportion likely to default). The ECB says that “Spain seems to be the most vulnerable country to adverse shocks, for instance a combined interest and income shock would lead to an increase in the proportion of households in distress by 35.9% as compared to the baseline”. 1. Interest rate effect higher than income effect. However, in Greece the income effects (loss of job) substantially increase the exposure to default. 2. Major differences across nations. For example, “an increase in the interest rate by 300 basis points would lead to an increase in the stock of non‐ performing loans by almost 50% in Spain, while in France it would only increase by 10.3%”. 3. “A combined interest and income shock has the strongest impact in Portugal, Greece and Spain – in all these countries the stock on non‐performing loans would increase by more than 30% as a result”. 2. This suggests that “for many Belgian borrowers” they are close to negative equity already. … the debts of the German and the French households are sufficiently covered with assets. To the contrary, the additional haircut on the value of the collateral may significantly increase losses faced by banks in Greece, Cyprus in Spain. The paper is fairly dry but paints a picture of continuing vulnerability in the Eurozone to rather slight changes in economic or monetary policy circumstances. It is clear that the entrenched downturn and current stagnation has not provided households with the opportunity to build more security into their individual balance sheets. The risk then is that the banking system becomes exposed to losses that the Member States are unable to deal with, given they surrendered their currency sovereignty. A far better plan after the credit binge and housing boom would have been for Member States governments to support growth, which would have helped the households save and reduce their debt exposure. But then we know about that. This video comes from a 1960 CBS Studio 52 program – What’s My Line? They are trapped inside the second American materialist revolution / experiment. A car based consumer war economy of epic scale. The resident banks of these jurisdictions are forcing these people to pay for the “capital” depreciation of this toxic legacy. Cars always come before food in the eurozone. I am afraid The Bull Mccabe (a fictional but very real character) and Father Coughlin ( a rebel anti Roman priest) have been proven correct in this time of financial stress. Despite being corrupted by hate – that hate was rational. Central Banks always bring external war – if victory in war cannot be acheived they devour their host by giving their favoured clients free money to buy real assets. Dork, it isn’t only cars that are involved. It is practically every corporate product. The TTIP treaty now being pushed by the US government would allow any US corporation to sue foreign governments who are signatories to this treaty, unless they decided that they were not going to allow a suit to proceed for some reason. This treaty is of benefit only to the US and its corporations and to no one else. It is to no one’s benefit to sign this awful treaty, yet Europe’s elite in the person of Mr Juncker are considering it. But he is dithering. The UK Tory government loves this treaty. But this is because they are interested in selling off any potentially profitable social service to their corporate pals while simultaneously reducing the range and reach of many social services. Why they would even contemplate allowing foreign corporations to sue the UK government for some of the most absurd reasons does not seem rational. But then, a rather large number of Tory back benchers appear to not be somewhat if not entirely non compos mentis. Given the history of the corporate British construct – it is no great surprise to me. Of course corporate Ireland is alien to me also so I guess maybe I have been beamed down much like Mr Bean. When I talk of cars I think of Burb life in general. I use it to describe middleclass people trapped inside a bubble of consumption without enough purchasing power to stop and think. As I have said before – I don’t believe in MMT. Its the classic war economy trap for you and escape for the elite. Its actually a very old record now. Whats happening to all western economies is the banks have created so so much assets. The economies have been geared post war to produce more and more stuff so as to beat this depreciation – so it is a goal isolated from peoples real needs. The banks who rule us are prepared to destroy all of our basic rations so as to sustain this consumer war economy. Eventually this rationing becomes a concentration camp. Its a obviously very anti human system. As can be gleaned from FT alphaville pages. – These Guys & Gals value machines more then people. Me thinks a epic hot war is coming. With Warburgs at either side of the table discussing reparations. As happened in the past many people will feel emotions that go beyond disgust. If any of us manage to survive this time around that hate will be channelled into something or other that is also very dark…………and so it goes on and on and on. Bill has talked of the ECB / BIS as a external entity. Could he give a description of what exactly it is & who it represents ? Certainly their dogma and tactics seem to orbit around the destruction of wealth & cultures through the use of scarce money which forces hyper exports in search of their tokens. It quite some system of control they have got there. A very political non political entity. IEA Oct oil market report. If this changes and we go back to the future – then the present european Industrial supply chain is Kaput. Russian oil demand is currently 400 KBD above the 5 year average. That means 2 celtic tiger irelands less oil to burn in Euroland. France had start better looking South to Spain rather then east to Germany. Germany now has currently nothing to offer but cold winters and cars without diesel. Nuclear power is adequate and spring ice melt feeds its Hydro in the early summer………. Food is not a problem in France. Russian energy demand suggests we are already in a war like situation. In particular Jet kerosene demand.